"The scope of this standard is to facilitate role-based access control (RBAC) for power system management. RBAC assigns human users, automated systems, and software applications (called “subjects” in this document) to specified “roles”, and restricts their access to only those resources, which the security policies identify as necessary for their roles. As electric power systems become more automated and cyber security concerns become more prominent, it is becoming increasingly critical to ensure that access to data (read, write, control, etc.) is restricted. As in many aspects of security, RBAC is not just a technology; it is a way of running a business. RBAC is not a new concept; in fact, it is used by many operating systems to control access to system resources. Specifically, RBAC provides an alternative to the all-or-nothing super-user model in which all subjects have access to all data, including control commands. ..."
Be aware that RBAC is required in systems where multiple clients (in the sense of, e.g., IEC 61850) need to access a server. One use case is where multiple power market participants want to manage a power resource. Vom 01. bis 05. April 2019 findet die Weltleitmesse der Industrie in Hannover statt. unterstützt IEC 60870-5-104 und IEC 61850! Die Sicherstellung der Verteilnetzfunktion sowie kostenoptimierte strukturelle Anpassungen durch die Versorgungs-netzbetreiber erfordern ein fortlaufendes Messen und Überwachen der dynamischen Belastungen in den Verteilnetzen. Mit dem BeEnergy SG Smart Grid Interface Modul lassen sich in Verteilnetzen an neuralgischen Stellen einfach und kostengünstig Messpunkte realisieren. Hier klicken und mehr Information finden. Treffen Sie die SGIM-Experten persönlich in Halle 13, Stand E81 (Efen GmbH). The growing success of the IEC 61850 series calls for guidelines for testing of substations implementing this standard. This technical report aims at producing a practical guide for protection, automation and control (PAC) engineers on best practise for testing of IEC 61850 Edition 2 with Tissues/Ed. 2.1 based devices and systems. Since the release of the first edition of the IEC 61850 standard in 2002-2005 thousands of substations have been built making use of the new multi-part standard. Most of those systems are more integrated and complex than the previously deployed, making use of multi-function capable IEDs and the rich feature set of IEC 61850. Especially the sending and receiving of protection trips via GOOSE messaging control commands/indications, monitoring and time synchronisation information over the same shared equipment or network will need to drive changes to existing test methods and practices as many of the traditional test boundaries have changed. Despite the large number of commissioned IEC 61850 substations considerable uncertainty among end-users (system integrators and power utilities) regarding the correct testing procedures still exists. Devices implemented according to the first edition of the standard also utilized a limited part of the test related functionality in the standard. Much of the functionality included in IEC 61850 to allow efficient, functional oriented testing has been clarified and extended in the second edition of IEC 61850 parts, 6, 7-1 to 7-4, 8-1 and 9-2. Therefore, there is a need to help the industry by describing the methods and principles for testing the IEC 61850 based applications. This Technical Report provides insight into the changing requirements and practice of testing following the introduction of IEC 61850 based devices and systems. One example is the disappearance of so-called ‘hardwired’ connections between substation automation devices. These connections are replaced by communication networks and this means that traditional simulation and isolation of signals for the purpose of testing is no longer possible. It is highly recommended to have a closer look at this document and review the content in detail. Because in the end it will be used as a very crucial "cook-book" for those that need to extend the standard series IEC 61850 and IEC 61400-25.
equipment to communicate with smart grids. Hier klicken ... für ein Kurzvideo und weitere Informationen ... von Martin Matt, Produktmanager Energy Communication bei HMS Networks, über intelligente Smart-Grid-Gateways. “Device redundancy of substation control units may be required in order to increase the availability of the substation automation system at the station level. System level redundancy is achieved by hot-hot or hot-standby configuration of duplicated station units that need to exchange information to ensure data consistency as well as coordinated and safe operation. A proposed redundancy system consists of two IED entities forming a logic IED. One or more lower level IEDs, e.g. merging units or circuit breaker, delivering the input data for the IED entities and getting results from the IED entities. One or more higher level clients receives output data from the IED entities for supervision or HMI. Additionally, a higher level IED might exist, which supervises the state of the redundant system. In this context this concerns especially the state of the IED entities, so that a failed IED can be detected and repaired before the second IED fails. The communication between the redundant system application and the lower level IEDs takes place with IEC 61850, mainly based on IEC 61850-8-1(MMS) reporting and commands, for time critical functions with IEC 61850-8-1(GOOSE) and IEC 61850-9-2(SV). The communication to station level clients based on IEC 61850 is typically MMS based for supervision, commands and settings configuration changes. Since MMS is acknowledged service, server and client are aware of each other and the client supervises the servers. If both redundant system IEDs are hot, the client might select which of them it takes for executing a service request." The TC57 P-members are invited to submit comments to this draft by 2019-03-29 at the latest. The application domains that need redundant systems may be crucial (for some high voltage systems) but may not be applicable for most systems in the energy delivery domain. This document is really of interest for a small, special group of experts ... not everybody interested in using IEC 61850 for exchanging some signals may need to check that draft document. One challenge with IEC 61850 is: Which subset out of a big standard series do I need to understand for my application - that means: YOU HAVE TO KNOW YOUR APPLICATION !! Automation and industrial communication are buzzwords for decades. They mean something quite different when you look at the 80s, 90s, 00s, 10s, today ... Where are we today? Not really far away from the 80s. The MAP (Manufacturing Application Protocol) project and especially the MMS (Manufacturing Message Specification) standard where the first combined attempt to define a single set of international standards for manufacturing automation systems. As you may know: they failed - because they were far too early. It really took 30+ years before the industry understood what is really needed besides the myriad of Fieldbusses!! 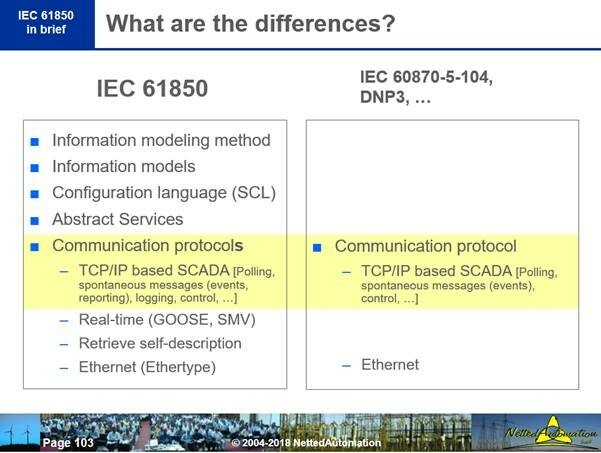 In addition to ISO/OSI Transport we need TCP/IP ... done in IEC 61850. Standardized system configuration is key for any future automation system ... as defined in SCL (IEC 61850-6) for energy systems. The third fieldbus war started some years ago and is expected to go on for many years. The standard series IEC 61850, IEC 62351, IEC 61968/70 (CIM), IEC 61400-25, ... provide most of what OPC-UA and TSN are looking for. It is likely that the providers of traditional and Ethernet-based Fieldbusses will migrate during the next years to OPC UA and TSN. OPC UA and TSN will be implemented and used - why not? In the meantime the energy domain is already using and extending the semantic models, applying the needed services and feeling happy with the standardized configuration language. The French novelist Andre Gide nailed it when he wrote, "Everything that can be said has been said, but we have to say it again because no one was listening." According to my 50 years of experience as a technician, the most crucial challenge in automation is this: People of different application domains (control center, RTU, protection, PLC programming, robot controlling, communication, security, engineering, maintenance, ... telecomms, internet, web, ...) DO NOT LISTEN TO EACH OTHER!!! If one expert of a specific domain talks - no one from the other domains is listening! Talk together and have a look at what people have said and done even decades ago! It may be better than what you were told. It may save you hours and days and weeks ... of struggling. Die konkrete Anwendung von CIM mit aktuellen Praxisbeispielen, Fragen und Antworten sowie Diskussionsgrundlagen erwarten Sie auf dem diesjährigen Workshop. Es ist ratsam, an diesem Workshop teilzunehmen und mit den Experten zu diskutieren, welcher Weg in der Zukunft zielführend sein wird (soll)! Klick on picture to magnify. I guess I got it ... you are analyzing the communication inside a station ... to the IEDs (protection, control, ...). The IEC 60870-5-104 plus a lot of utility or project specific (signal) engineering will do the job – has done it for decades. The engineering is the key issue when comparing the two standards … if you can compare them at all!! From a message overhead point of view, you can say, that both are more or less the same ... because they use both Ethernet and TCP/IP. There is no benefit to use one or the other. It is likely that IED vendors will mainly focus on IEC 61850 ... and may get rid of 104 in the long run. Another issue is: To use GOOSE for interlocking … to get rid of copper … or use it for tripping … and use sampled values some time down the road. Finally there is an issue with manpower: If the utility has senior experts in 104 close to retirement … they should wait until they have retired. Yes! I have seen many old engineers not willing to learn something completely new!! Click HERE for a detailed comparison written by domain experts. Hope that helps a bit more. "The international standard defines the emerging requirements from physical resource description side to facilitate the design, system integration, test, fault analysis and commission, etc. during different stages when IEC 61850 is applied. It described how the physical resource information, such as IED’s dimension, communication port and optical connection, is to be modelled using the System Configuration Language (SCL) which is incorporated under IEC 61850. The application scenarios include but are not limited these mentioned stages. Physical information related to infrastructure in electrical substations, including cubicle, trench, optical, wire, etc. Physical information related to devices in electrical substations, including device dimension, amount model, physical port, etc. The proposed international standard specifies a file format for describing dimension, communication connection port, optical wire, cubicle, trench related to IEDs within substations, and the relations between them and logical functions." The NP notes that "In China, by the end of 2016, nearly 3,000 substations of 110 kV or above based on IEC 61850 had been under operation." The standard series IEC 61850 is really growing in 2019, see extra post. Testing the automation, control, and SCADA communication in IEC 61850 Substation Automation System (SAS) is as time consuming as testing the protection – or often even more. StationScout simplifies the testing and reduces the required effort significantly. The Smart Grid Interface Module (SGIM) is a ready-to-use system to monitor measured electrical values in switch cabinets and cable distribution cabinets. The mechanical design of SGIM is in line with industrial standards and is especially meant to be installed in a 185mm busbar system. SGIM is built from two main parts: the installation platform and the plug-in unit. The plug-in unit contains all necessary control, communication and measurement functions to provide measured data either to a cloud-based data management system or via standard IEC protocols like IEEE 1815 - DNP3, IEC 60870-5-104 and IEC 61850 as well as industrial protocols like OPC/UA. The device includes a local web server for the visualisation of the acquired data, the configuration of drivers and communication protocols as well as an interface to the WEB-PLC editor. Click HERE for more information (Data Sheet).